At first blush, we find the KitNipBox is the most reasonably priced for what you get, and shipping is free in the United States. While products can be compared across competitors, KitNipBox takes great care to locate products that are made in North America. The treats are strictly all-natural, organic and/or grain-free to avoid the pesky allergies and tummy-upsetting foods that can be found out there. Subscribers may also indicate if they do not want to receive food items and switch them for other products. We find these goodie boxes come with unique items intended to keep your cat healthy, fit and, above all, happy. In addition to fun toys and delicious treats, there are some must-have accessories, innovative new gadgets, health and hygiene items and even some surprises. Items are only selected for each box after meticulous research and analysis of each item is performed. They are only satisfied with items that have positive reviews and a proven track record for quality and safety. 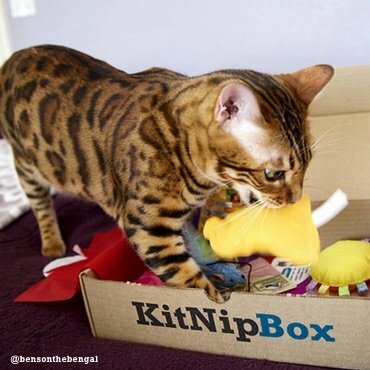 All items selected for KitNipBox are researched and tested for quality and safety. While products are researched globally, purchases are mainly made in North America and some from Europe, Australia or New Zealand. 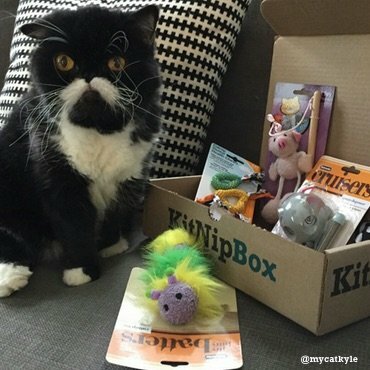 You get a unique referral link with your account so that anyone who subscribes using your link will earn you an additional 15 percent off your next KitNipBox. Your friend also gets 15 percent off their first box. 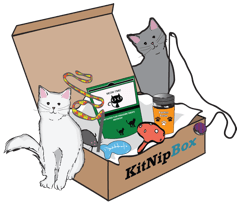 If you refer enough friends in a month, you can qualify for a free KitNipBox. 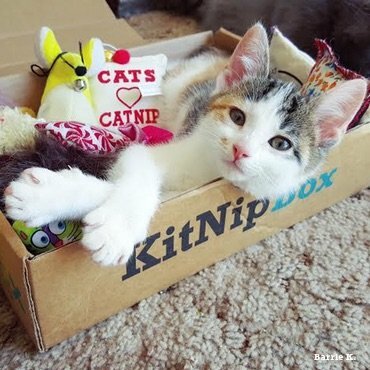 A portion of the proceeds from KitNipBox profits is put toward the support of hundreds of animal welfare organizations across the nation. This includes shelters, rescues, TNR efforts and many other feline welfare causes. KitNipBox is good value for the price. Consistently, when we compare the typical retail price for the items contained in the Happy Cat box, we are receiving at least $28.00 worth of products for $19.99. The highest discount we could find is capped at 15 percent, once for the first sign-up and then if you are able to get friends to subscribe using your unique link. There is a place to enter a discount code but only upon signing up. Only option is a monthly subscription with automatic renewal. If you want to change the frequency, the only choice is to cancel the subscription. Getting 5-8 items each month can pile up over time if you only have one cat to play with them. While it is reasonable for the price, it can seem like a little too much after some months have gone by. Sign-up is straightforward and easy to follow. You can get start just by submitting your email address, but you won’t start receiving items until you designate your preferred box and set up your payment method. 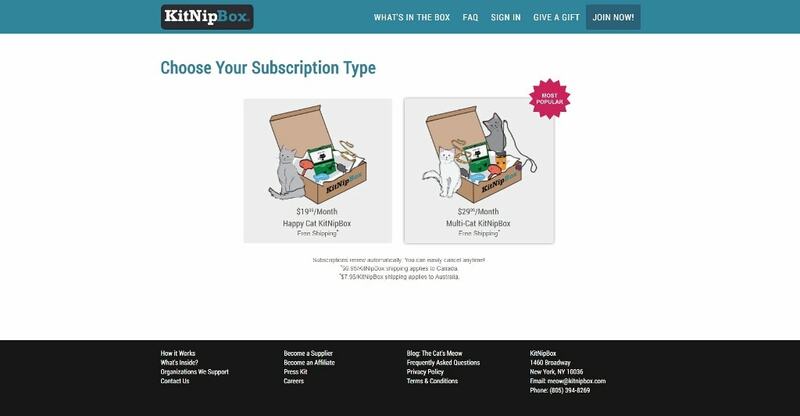 Changing your KitNipBox option is also easy. If you have a coupon code, you can enter it to ensure your discount. There is also a sign-up discount of 15 percent for your first box. Once you are signed up, the subscription renews automatically each month to ensure you receive your monthly goodie box. We especially like that shipping is free within the United States. Shipping applies to Canada for $6.95 and $7.95 going to Europe, Mexico and Australia. 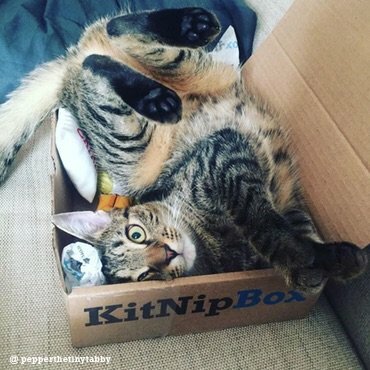 We find pricing on the KitNipBox subscriptions to be reasonable. 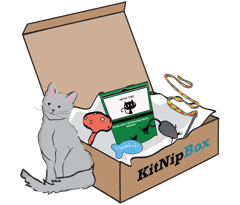 When compared to comparable boxes, KitNipBox is one of the less expensive choices. Competitors appear to offer deals with a recurring subscription, for example, CatKit offers 8 percent for a minimum of three months, and PurrPacks offers 10 percent. However, both charges extra for shipping. You can get started with KitNipBox for $19.99 a month applying a 15 percent sign-up discount and free shipping in the U.S. This lets you start receiving your monthly goodie box and gives you the chance to evaluate the value for money. 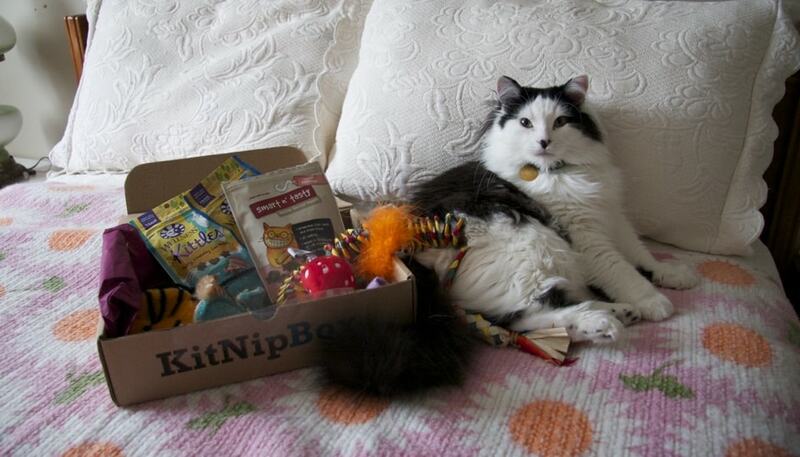 We are pleased with the value we have seen in the KitNipBox product selections. While it does not provide for your option to only receive a box when you order one, you can easily cancel at any time by logging into your account and selecting “Edit Subscription.” Cancellation is complete upon confirmation through an email. It is best to cancel at least one week before the next shipment to avoid being charged for the next box you receive automatically. Common among the KitNipBox subscribers is how well-received these monthly subscription boxes are. This is similar to the competition. It is safe to say that there is hardly a cat-treat box subscription that a cat won’t like. Cats are engaged from the moment the box arrives. It is, after all, a box. Since each month’s subscription box contains new and different items, you get a chance to see what appeals more strongly to your cats over other items. Of course, those products that are scented or filled with catnip are a treat to adore, for sure. This display of cat-appreciation is possibly as much fun to watch as it is for the cats to enjoy. We could not find a reception of receipt of goods that was not purely positive. Cats are reportedly engaged from the moment the box is opened. Their curiosity carries them through discovering each item and finally occupying the empty box. Of particular interest is the corrugated cat-scratcher that also comes with catnip that you can sprinkle into the cardboard crinkles to make things even more interesting. The choice of items is under your control. You get to manage your subscription easily online with the drop-downs if you don’t want to receive the treats and opt for more toys instead. Even cancellation is an easy process of following the prompts. The only consideration is timing and you will need to confirm cancellation in an email. As this is a monthly subscription, you need to be careful to cancel before the next shipment is in effect. Otherwise, you could be canceling mid-shipment and be charged for another month. Returns are managed similarly across competition. You can email admin with any issues over defective goods and arrange for their replacement. The sooner you handle any returns, the better. Given that each box among the choices of subscriptions has similar assortment of toys and treats, your cat is sure to pile up a reserve of goodies. We find that going to extremes with three and more box options can get complicated. Even if you have three or more cats, you will find that their collection of products will suffice. You can be watchful of the items that become favorites and get licked to bits or quickly destroyed from too much fun. One of the things we like about KitNipBox treats is their commitment to finding all-natural, organic, grain-free products that are only produced in North America, Europe, Australia or New Zealand. There are no treats that come from China. 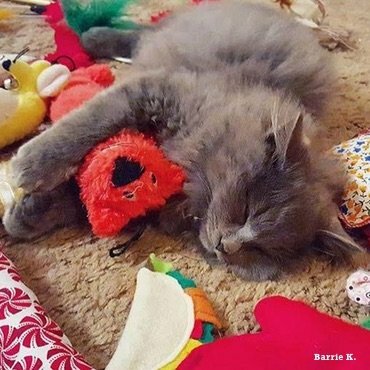 There may be some toys that come from China, but rigorous product testing is conducted to ensure the quality of the product and for your cat’s safety. You can also indicate on your monthly order if you prefer to swap toys for treats if you do not want to receive any edible items. 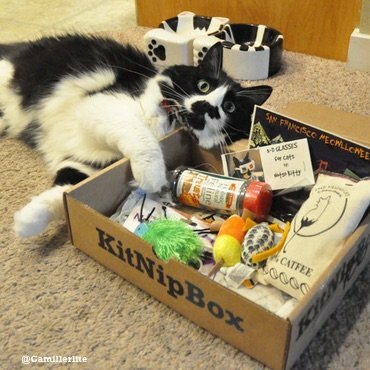 As far as price points, we find the KitNipBox subscriptions extremely reasonable. The Happy Cat is $19.99 and contains five toys and treats. The Multi-Cat is $29.99 for seven to eight treats and toys. That is well below CatKit, Cat Lady Box and Rescue Box that all average $35.00 for the same thing. Signing up is very easy to do. You just choose a subscription plan, enter your billing information and start receiving your KitNipBox each month. You can cancel your subscription at any time, and shipping is free in the U.S. Billing occurs first upon signing up with your first box. After that, your card is charged 1-7 business days before the next shipment. Shipment is either made by the 1st or the 15th of each month depending on your shipping cycle. How Long Will It Take To Deliver Your Purchase? 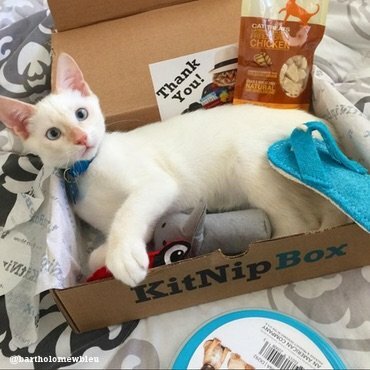 Your satisfaction is our primary goal and we want you to be 100 percent satisfied with your KitNipBox. If you ever receive a product that is defective, we would like to hear from you via email at meow@kitnipbox.com so that we can work with you to replace the item as soon as possible. You can log into your account to cancel your subscription at any time. You proceed to “Edit Subscription” then select “Cancel” in the drop-down menu and simply follow the prompts. You will need to confirm your cancellation in an email, and be sure to cancel at least one week before the next shipment is due to avoid further billing. We appreciate any feedback you could share on your decision to cancel at meow@kitnipbox.com. If there is a FAQ you are looking for that was not included here, please let us know in the comment section below. 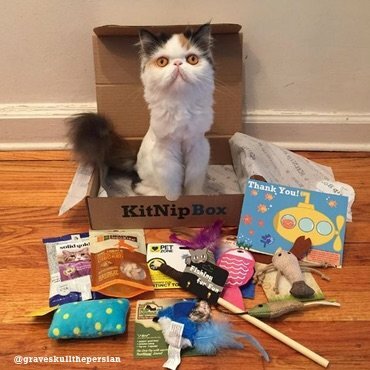 If you are a proud cat owner looking to receive a regular shipment of goodies that are sure to entertain your favorite furry feline friend, then the KitNipBox just might be the “purrfect” addition to your subscription addictions. The items contained in each box are a hit with cats and deliver hours of entertainment both for the cats and their owners to watch how much they get out of these goodie boxes. It is worth giving this one a try just to see for yourself how much fun your cat will derive from the pleasure of receiving one of these delightful boxes, and you can leave your comments about your personal experience once you do. If you don’t have cats but simply adore anything to do with them, then the CatKit may be more to your liking with items related to cats that are designed for people. They provide such items as cat-themed and cat-shaped mugs, T-shirts, jewelry and more. Just be prepared for the recurring price tag. There is a box to enter a coupon code in the sign-up process. There is also a 15 percent discount you can take advantage of for being a first-time subscriber. You may find coupon codes that offer a deeper discount on specific sites that offer such codes, but in our searches, the highest discount we could find for KitNipBox was 15 percent. There is an opportunity to gain 15 percent off your monthly boxes if you get friends to subscribe under your unique link. If you are industrious in this effort and get at least 10 people to sign up under your link in the space of one month, you can even get a free box delivered to you. 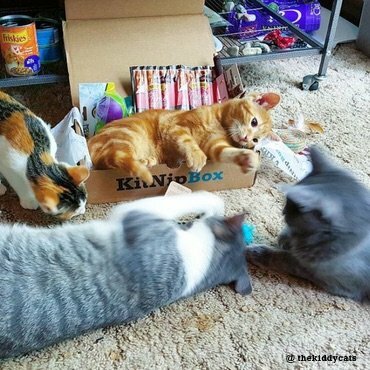 KitNipBox is a sure hit with cat owners for the simple pleasure they witness their cats enjoying when that goodie box is opened up and laid out for them to explore. There is hardly a cat owner who would not find equal pleasure in seeing their cats having so much fun with new toys and treats each month they can call their own. If there is an item your cat is not as excited about this month, you can be sure there will be something to surpass it next month. The price is justified both by the convenience and the hours of pleasure it derives. As cat owners, we live for these moments to make our cats happy. at first i wasn’t sold on the whole subscription box thing, but the quality of the cat toys inside is awesome. my sister got this for me as a gift for my birthday in november. do you know how i can see which shelters kitnipbox donates funds to? id love to recommend my local shelter to them, i know they are constantly looking for extra help. Hey Courtney! Thanks for your comment. To answer your question about donations, you can check out a few of the national organizations they support at https://www.kitnipbox.com/#goodwill under the “Organizations We Support” heading. There is also an email address listed for you to recommend your local shelter for their support list! Hope you find this helpful, and that your shelter is added to their supported organization list.